Been in Miami for a while now and have always been intrigued by the existence of guayaba in desserts and dishes here. There is even a whole section devoted to stocking guava paste and such varieties in the local supermarket. It's basically the pink guava fruit. Guayabas is the spanish term for it. Recently, we were invited to a family dinner and had our first experience on eating guava. It's used like you would in a cheese platter, kinda like how you eat figs with cheese and crackers. They happen to have a guava tree in their backyard and we were treated to some fresh pink guava! Was told it's a Cuban thing to have guava used in baking and cooking. So naturally I was curious to try using it. The safe start would be something sweet. In Singapore and parts of South East Asia, we also have guava but they are the green ones. Pink guava only exist in popular drinks and you don't really hear them consumed fresh, much less in a paste form. At a recent food truck experience, I stumbled upon the guava and cheese donut - basically a guava and cream cheese blend injected into the center of a glazed donut. I mean, it was quite memorable. 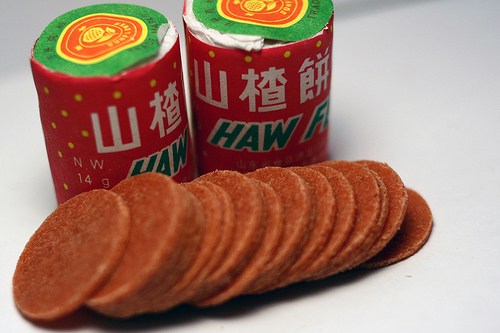 It reminded me of flavours of my childhood - Haw Flakes! If you were from Singapore, you would have grown up with such nibbles and titbits. So as bravery would have it, I decided to put a little spin on my favourite oatmeal cookies using this recipe as a base and changing up a few things; dial down the sugar and add guava and cheese as the inspired ingredient. The result is a cuban inspired guava cheese pecan oatmeal cookie. It's a mouthful, yes, but wait till you bite into this cookie. Sorry, couldn't help it. I had initially thought of adding the guava and cheese into the cookie dough altogether. Then I suspected that the flavour of the guava might get lost within all the pecan and coconut flavour so decided to seperate the ingredients and pipe the guava cheese as frosting on top of the cookie. I had a good feeling about this recipe that I decided to shoot a time-lapse video as I went along. So here goes. The recipe. Like I said, the cookie base recipe was based on this recipe I found. If you just want to make the oat cookie, go to that recipe. Otherwise, this recipe might be too bland without the guava cheese frosting. A word on the soft butter. It is important to make sure it is at room temperature and not fresh out of the fridge. Those are good for pastry but not for cookies. I used cold butter and thought 10 mins was enough for it to reach room temperature. Ok I was impatient. I ended up having to work the butter into the sugar and eggs for over 15 mins and my arm was sore by the end of it. So save yourself the trouble and leave cold butter out for at least an hour at room temperature. Also one thing you can do is to replace the guava paste with figs or dates paste. Or if you like, use haw flakes instead. It might just work the same. In a mixing bowl, add soft butter, sugar, molasses and eggs. Mix well. Mix till you achieve a paste like smooth consistency. Add oats, coconut flakes and pecans. Keep mixing till combined. I recommend using a wooden spoon for this as it will make it easier. At this stage, pre-heat oven to 350F and start on the guava cheese frosting. Place into a piping bag. If you don't have a piping bag you can also simply use a spoon for the frosting. Roll cookie dough into small balls and flatten with thumb to create a middle indent for the guava cheese frosting. It should give you about 16 cookies or more depending on how big or small your cookies are. Pipe guava cheese frosting on top of the cookie filling up the indent. Place cookies in a preheated oven at 350F and bake for 30 mins. Let cookie cool before storage or consuming. My frankenstein creation. I believe it was a hit! Wanna give a special shout out to Sherri & Greg at Watch Learn Eat blog - which this recipe is based and adapted from. Thank you for sharing!